Children’s vision care should begin at birth and continue throughout childhood and adolescence. Without professional vision screenings, children can grow up with a distorted vision that eventually causes complications during the school years. According to the American Optometric Association, undiagnosed and untreated vision problems can worsen in children because the brain learns to accommodate the distortion over time. Furthermore, untreated vision discrepancies can lead to academic, athletic and social handicaps that hold kids back from their ultimate potential. Yes. Your child’s first eye exam should occur before he or she ever leaves the hospital at birth. 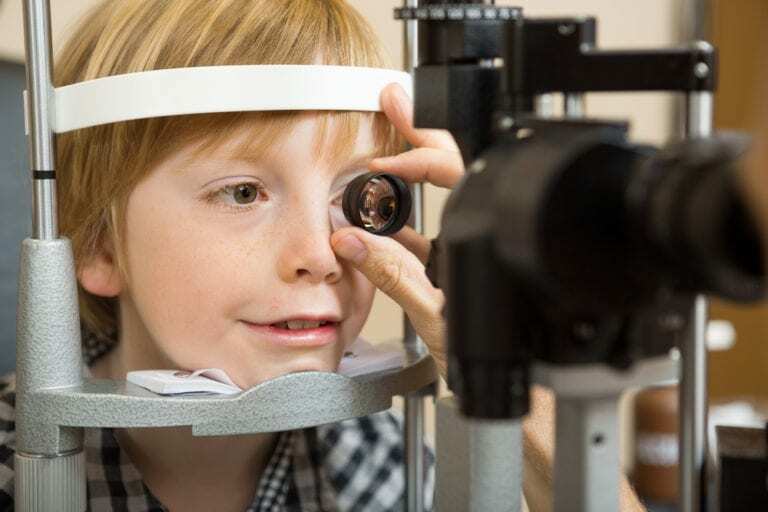 Additional pediatric eye health screenings should occur every year from that point forward, with the first vision acuity test occurring around 3 ½. Even if your child performs well on vision tests, contact your eye doctor if you notice that your child is suddenly rubbing his or her eyes, squinting or demonstrating behaviors that seem to compensate for poor vision, such as sitting too close to the television. What should I expect during my child’s eye examination? There is little you can do between eye exams to help your child’s vision health other than encouraging him or her to wear UV-protective sunglasses and feed your child a nutritious diet high in antioxidants like beta carotene and lute in, as well as omega-3 fats. Contrary to popular belief, sitting too close to the TV will not harm your child’s eyes.